Carl Zeiss Meditec announces the USA release of the new FORUM Viewer App. 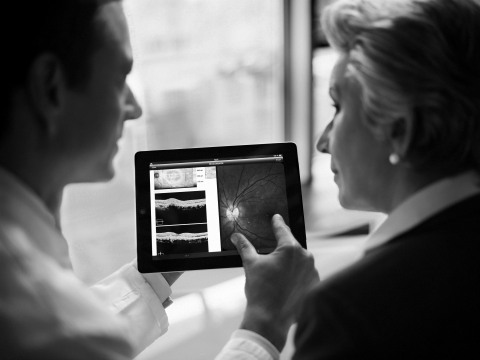 It provides doctors access to images and reports from the broad range of ZEISS and third-party diagnostic devices that can be stored in FORUM. As an extension to FORUM Archive & Viewer, the successful Eye Care Data Management System from ZEISS, the company has now released an app for iPads. The new FORUM software application extends FORUM Viewer to iPads allowing doctors convenient and secure access to diagnostic patient data wherever and whenever they may want it. Healthcare today is transitioning faster than ever to the use of mobile devices. Over fifty percent of US physicians own an iPad, and approximately one-half of those use their device at the point-of-care, according to Manhattan Research. "Access to clinical data away from a desktop computer or a diagnostic device is now crucial in improving efficiency and advancing the quality of care," says Dr. Ludwin Monz, President and CEO of Carl Zeiss Meditec AG. "The FORUM Viewer App now brings diagnostic data to a clinician's fingertips -- whether in the exam lane, on the way to their next patient, during a patient consultation, or remotely outside the office." The app solution enhances the diagnostic workflow as it no longer limits data access to stationary computers and utilizes the simple, intuitive iPad interface. Image data and patient information can be displayed without any loss in quality. The new software runs on the iOS operating system from version 6.01 upwards and is now available in the USA market for the current iPad product family. For the connection of the app, FORUM Archive from version 3.0 onward is required in conjunction with an additional license. Demo data is immediately accessible after the software is downloaded. FORUM is a data management system for ophthalmology and optometry. FORUM allows data availability through central storage, increases workflow efficiency by providing data from multiple instruments and supports doctors in their clinical assessments. Carl Zeiss Meditec AG (ISIN: DE0005313704), which is listed on TecDax of the German stock exchange, is one of the world’s leading medical technology companies. The company supplies innovative technologies and application-oriented solutions designed to help doctors improve the quality of life of their patients. It provides complete packages of solutions for the diagnosis and treatment of eye diseases, including implants and consumables. The company creates innovative visualization solutions in the field of microsurgery. The medical technology portfolio of Carl Zeiss Meditec is rounded off by promising, future-oriented technologies such as intraoperative radiotherapy. In fiscal year 2011/12 (ended 30 September) the company's more than 2,400 employees generated revenue of just under 862 million euros. The head office of Carl Zeiss Meditec is in Jena, Germany. The company has subsidiaries in Germany and abroad; more than 50 percent of its employees are based in the USA, Japan, Spain and France. The Center for Research and Development (CARIn) in Bangalore, India and the Carl Zeiss Innovations Center for Research and Development in Shanghai, China, strengthen the presence in these rapidly developing economies. Around 35 percent of Carl Zeiss Meditec shares are in free float. The remaining approximately 65 percent are held by Carl Zeiss AG, one of the world’s leading groups in the optical and optoelectronic industries. Carl Zeiss offers innovative solutions for the future-oriented markets of Medical and Research Solutions, Industrial Solutions, Eye Care and Lifestyle Products. Carl Zeiss AG, Oberkochen, is fully owned by the Carl Zeiss Foundation.